WARNING: This hike passes many beautiful spots along the Merced River, including several areas that look like inviting swimming holes. Absolutely do NOT get in the water! Over the years, many people have died getting in what they thought was calm water only to get swept away by the current. Going over Vernal Fall or Nevada Fall would be a horrible way to die. Seasons: Year-round. Spring is the most dramatic time for waterfall viewing; during winter, the section under Vernal Fall is typically closed. The Happy Isles Trailhead is located in the southeastern corner of Yosemite Valley, roughly a mile east of Curry Village (Half Dome Village). Yosemite Valley shuttle stop 16 provides easy access. If you are driving, a hikers parking lot is located just east of Curry Village (Half Dome Village), but like all parking lots in Yosemite Valley, the spots get taken up very early in the day. From the Happy Isles Trailhead, follow the paved trail south as it begins its ascent up the narrowing gorge that surrounds the Merced River. At .9 miles is the first hikers' bridge and this spot makes a good turn-around point for casual hikers who just want a short stroll. From the center of the bridge, you can see Vernal Fall far in the distance if you look carefully. A water fountain and bathrooms are on the far side of the bridge. Continuing up the gorge now on the right (south) side, the trail gets more strenuous with many granite steps making their way up the steep slopes in front of Vernal Fall. 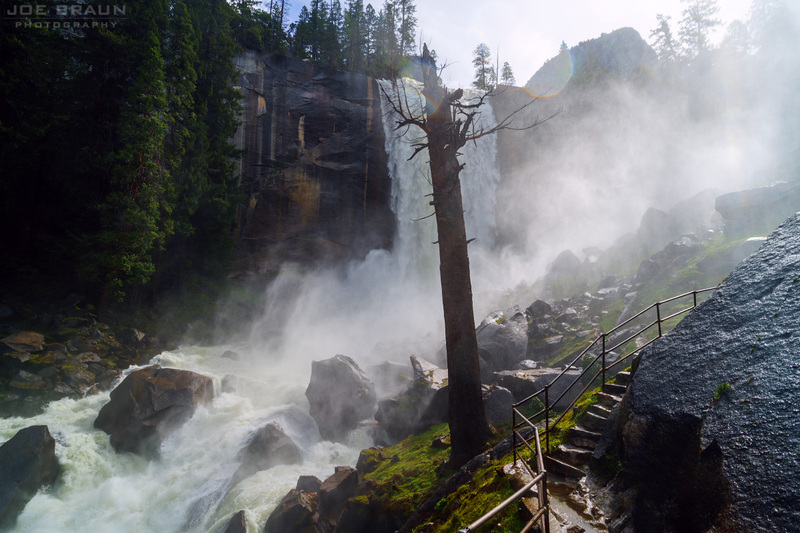 During spring runoff, this part of the trail is thrilling as spray from the powerful fall makes everything wet and slippery; there is a reason they call it the Mist Trail! (While you will typically remain dry during the low-flow late summer and autumn months, be prepared to get wet during spring and early summer.) Just past the spray zone, the steps get even steeper as the ingenious trail heads into an alcove before making its final ascent to the top of the fall. 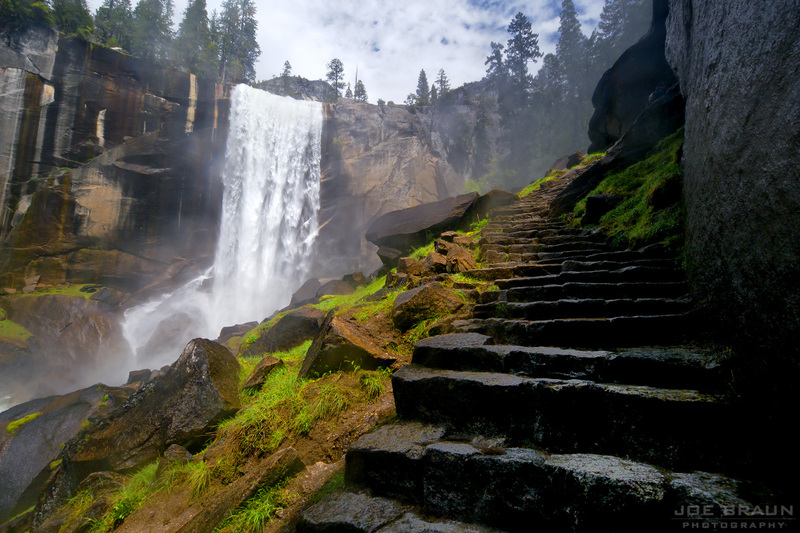 While your legs may burn from the strenuous climb, the view at the top of Vernal Fall will be worth it! Casual hikers may want to consider turning around at this point. 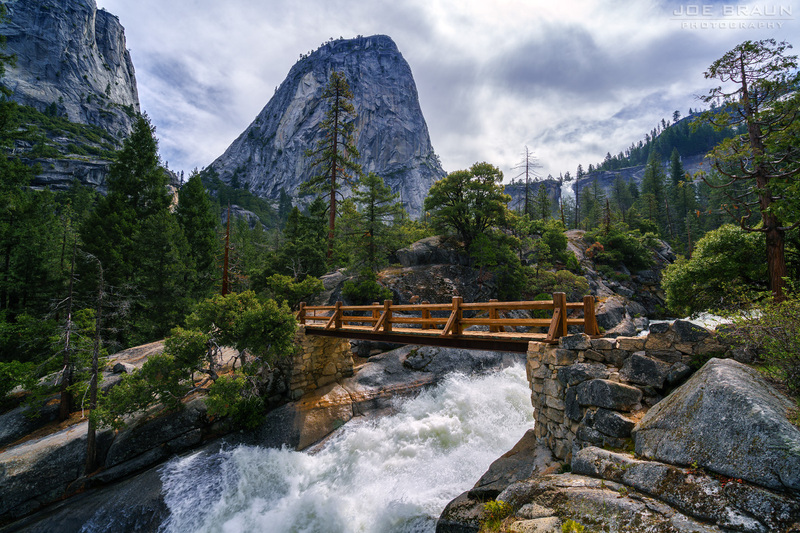 As you approach the hikers' bridge over Nevada Fall, look for a short spur trail on the north side of the river that takes you to a nice overlook just next to the fall. The granite formations on the south side of the Nevada Fall hiker's bridge also makes for a great place to relax and take in the views. Of course, be careful near the edges and do not get in the water! For your return hike back down to Happy Isles, you could retrace your steps, or you could take the alternate John Muir Trail back down. 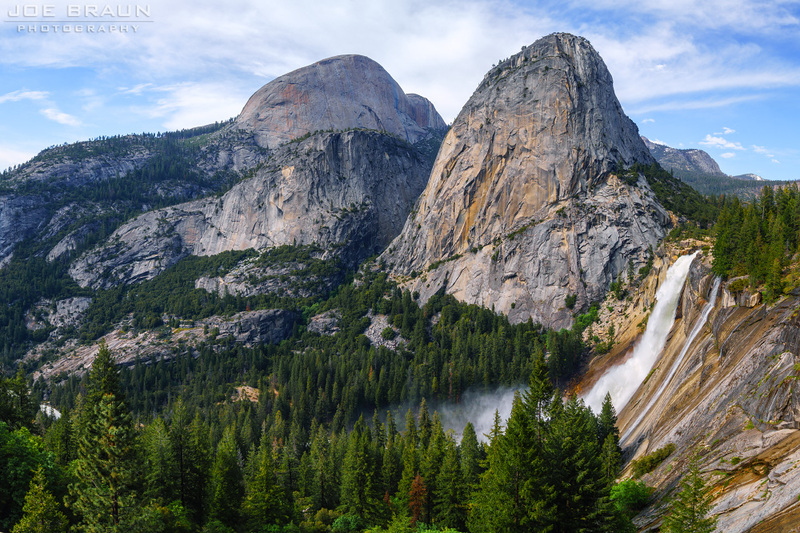 While the Mist Trail gives the close-up waterfall views, the John Muir Trail was chiseled out of the high granite cliffs to offer wonderful panoramic landscape views. (This trail is mostly dry although some years, seasonal waterfalls can make things a bit more interesting.) Follow the trail back down to the junction with the Mist Trail and then retrace your steps to Happy Isles. The Mist Trail is the epitome of awesome Yosemite hiking scenery, offering up amazing waterfall views from the ingeniously constructed trail as it wanders through the granite wonderland. But as this hike is probably on everybody's "Top 10 Amazing Hikes" list, be prepared to share the trail with many other people; this one is understandably popular!